Greg Carbin, his son Jonathan, David Cleaver, Ariel Cohen, and myself arrived in Baxter State Park during the afternoon of August 6th, where we would spend the next two nights in a wooden cabin located in the Roaring Brook Campground, and make an ascent of Katahdin/Baxter Peak on August 7th. The cabin we rented was very basic...a floor, walls, and 6 bunks in one small room, 6 bunks in a second room. It was shelter, that's all we needed. We shared the cabin with a French couple from Quebec the first night. During the second night, we shared the cabin with a father/son from Pennsylvania, and another father/son from Germany. All of our roommates were cool. We ate well and drank well during our two nights in the wildlands of Maine. Shish Kabob's and pale ale were on the menu the first night, and we ate bratwursts the second night. 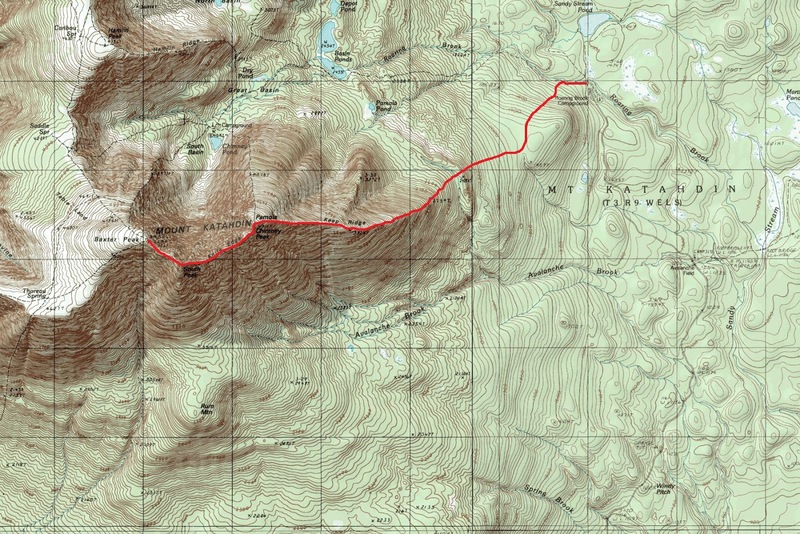 We woke up at 430 am on August 7th, and started up the Helon Taylor trail by 515 am. Apparently, Ariel was full of adrenaline...he set a fast pace as we made our way up through the forest below treeline. I barely managed to keep up with him, and within an hour, our separation from the rest of the group was significant. Above treeline, easy scrambling was encountered as we ascended the eastern ridge of Pamola...Ariel slowed down his pace here, and I passed him by. After I arrived at the top of Pamola, I took a break while waiting for Ariel to catch up. The sweeping basin between Pamola and Baxter Peak fell before my feet, bounded by the Knife Edge Ridge to the south, and the sheer rock face leading to the top of Baxter on the west. After Ariel arrived, we down climbed class 3 rock into the gully located between Pamola and Chimney Peak. Then, we ascended exposed class 3 rock to the top of Chimney Peak. We were now on the Knife Edge Ridge. Although moderately exposed in some sections, this ridge was characterized by abundant hand holds, and the climbing never exceeded class 3. The airy traverse along the ridge was wonderful, and has motivated me to find similar ridge lines on other mountains in the future. At around the halfway point of the Knife Edge Ridge, the exposure started to wear on Ariel's nerves...he ended up taking a long break and waited for the other half of our group to arrive. I continued on without him, ascending the steep rock covered slope of South Peak, and then boulder hopped over to the summit of Katahdin/Baxter Peak. I arrived at 915 am, took my pictures, refueled, and then started the descent back down the Knife Edge. I passed Greg, Jonathan, Ariel, and David about an hour later. They got some beta on the remainder of the route, and then we departed in opposite directions. I eventually re-encountered Chimney Peak, and faced the crux of the route...the exposed class 3 downclimb off Chimney Peak into the gully shared with Pamola. I hung off ledges, lowered myself down 5-6 feet in a few places, and breathed a huge sigh of relief when I was finally on terra firma. The rest of the route was just a long hike back down to Roaring Brook Campground. 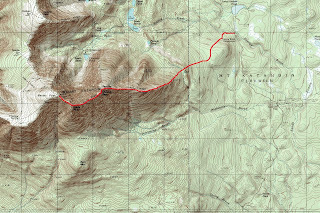 Katahdin is an outstanding, exciting mountain...the scrambling is just as exposed, and probably more involved than what I encountered on Longs Peak, and the vertical gain from trailhead to summit rivals most other peaks in Colorado.